Pasha is a traditional Finnish Easter dish, especially in the eastern parts of the country. It was brought here by the Russian Orthodox church hundreds of years ago, and is eaten to celebrate the end of the lent. You may know pasha with a little different name – pascha, pashka, or something similar. Pasha is a Russian word for Easter, originally from a Hebrew word pesah. The transliteration from Cyrillic alphabets explains the small variations in the name. Traditionally pasha is made in wooden, pyramid-shaped molds. Since Easter is the biggest holy day of the Russian Orthodox church, the molds are often carved with religious symbols such as XB, short for Russian words ?Christ is Risen. The pyramid shape reminds of the Jews’ slavery in Egypt. Unless you use Russian tvorog, put the quark or curd cheese in a coffee filter for 12 hours. During that time the liquid will separate which makes for a denser Pasha. Mix sugar and butter until airy and smooth. In a separate bowl whip the cream until hard. Add all remaining ingredients in the sugar and butter mixture, mix until smooth, and finally carefully add the whipped cream. Pour the mixture in a double-layered coffee filter or sieve, and let stand in a fridge for 24 hours. When 1-2 dl of liquid has dripped from the pasha in the fridge, tip it over on a plate and decorate with candied lemon zest and raisins. 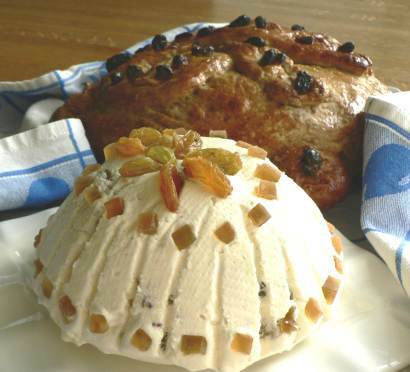 Kulitsa is also a Russian Easter dish, which is often eaten with pasha. It is a sweet, buttery, and incredibly tasty loaf, which is sliced like bread and and topped with heaps of pasha. I urge you to try this, it is absolutely delicious! Make a dough (as you would for any bread/roll), and let it rise for 30 minutes. Make one or two round loaves on a baking sheet covered with parchment paper. Decorate with dough strips, candied lemon and raisins (make e.g. letters XB). Heat the oven to 180 C (355 F), but don’t let the loaves rise for longer than it takes for the oven to heat, otherwise they will loose their shape. This is Anna’s version of the same recipe – the kulitsa is on the background but it’s really the star attraction here. Perfect for an artery-clogging Easter breakfast! Jos et k?yt? ven?l?ist? maitorahkaa, valuta rahkaa suodatinpaperilla vuoratussa kahvinsuodattimessa noin 12 h j??kaapissa. Vaahdota voi ja sokeri. Lis?? kaikki muut ainekset, lopuksi vaahdotettu kerma, ja sekoita huolella. Painele massa kahdella suodatinpussilla verhottuun kahvinsuodattimeen, j?t? keskelt? v?h?n koholle sill? pasha painaa valuessaan. Anna valua j? ?kaapissa vuorokauden verran. Kumoa tarjoilulautaselle, koristele rusinoin ja sukaatein. Tee hiivataikina, anna sen kohota 30 minuuttia. Leivo nousseesta taikinasta py?re? leip? tai kaksi leivinpaperilla, koristele taikinasuikeroin ja -kirjaimin sek? rusinoin ja sukaatein. ?l? kohota en?? pitemp? ?n kuin mit? uunin esil?mmitys 180 asteeseen kest? ?, muuten leip? menett?? muotonsa. Paista 180 asteessa 30 minuuttia. Tarjoa viipaleina, sivele paksulti pashaa p??lle. Oh lovely, really. I especially like the added fruit, ripe for expression – think I’d do an ichthus. My Finnish family (#3 of 3) formed pasha in a clay pot lined with cheesecloth. Thanks for the inspiration, Antti! Nice pasha, Antti, and very cute bunnies (how did you make them stand still for so long? :-) But no picture of the famous kulitsa!?!?! Thanks for making pasha for all! We’ve had summer-like temperatures in NYC so I’ve been way too busy touring the neighborhoods w/ Pekka to post my pasha pics. I baked a kulitsa though so maybe I’ll post that, later on. Now I believe you:) Nice kulitsa & pasha, Anna! I fully support the clogging of arteries in the name of holiday celebrations. 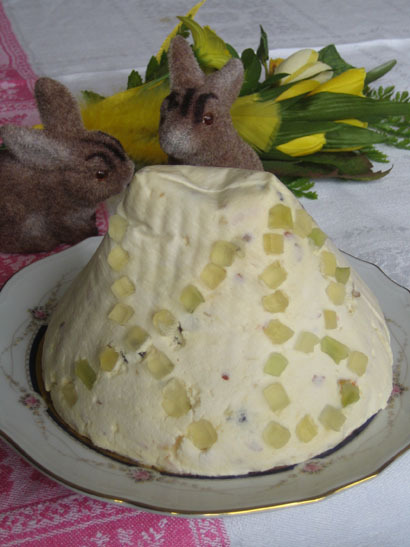 My auntie who grew up in St Peterburg used to make this dish every Easter. I have not eaten it since my childhood in Germany but next year I might try making it because your photos have inspired me. wow, I have never heard of these dishes. Thanks for posting about them, they seem wonderful. 1. Is there no egg in the pasha english version? 2. No flour in the kulitsa english version? I just stumbled across your blog, it’s fantastic! I’m just wondering wether you could help me to find the recipe for the best artichoke soup I ever had. We stayed near Yll?sy?rven last year and there I had that out of this world artichoke soup. I’m still looking for the exact way of making it.